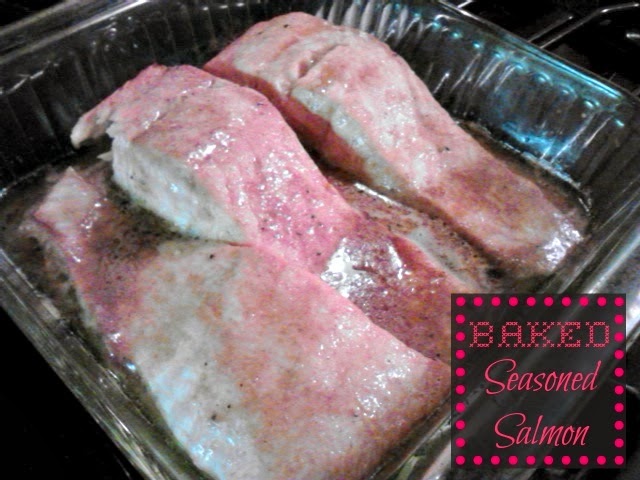 Food Hussy Recipe: Baked Seasoned Salmon | The Food Hussy! Sometimes I get food cravings - no - I'm not pregnant - I just want certain foods. Last week - it was salmon - I've been dying for salmon! I got a bit over a pound at Meijer and was a bit shocked that the guy at the seafood counter had NEVER HAD SALMON! He asked me if it was good (no - I'm just spending $10 on something crappy) and I said YES YES YES - go home tonight and make some! I decided to take my own advice and made mine. I was looking for a recipe that I could bake and that was EASY. And after some googling - I found one of Food.com. This was great because I had all the ingredients and didn't have to do much! Woohoo! I did use balsamic vinegar instead of cider vinegar because that's what was in the cupboard and I think I liked it better!!!! I LOVED this recipe - it was tart (from the vinegar), lemony (from the lemon - duh) and buttery (from - you guessed it - the butter!). This recipe is definitely going to be saved and made again and again in our house! Arrange filets in a shallow baking dish. Mix together the remaining ingredients, & pour half of this mixture over the fish. Bake 20 minutes, basting with the remaining sauce. When done, sprinkle with paprika & chopped parsley, if desired. Did you announce the winner of the dinner for two and I missed it? Just curious, I'm new to your blog and not sure how things work. Yup - I just add another comment on the giveaway post. I drew the winner a couple days ago - but keep reading. I have a $50 giveaway to another steakhouse coming up next week!